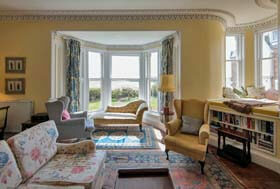 Elie is a very popular summer holiday destination and therefore has great facilities for young and old alike. There is a water sports centre, golf, tennis, walking, and lots more to do on your doorstep. The village is well served by a good deli, cafes and pubs. The 2 mile beach is one of several lovely beaches along this very beautiful coast. The East Neuk of Fife, in which Elie is one of several villages, is extremely pretty. The fishing villages along the coast are well worth exploring and you can find lots of interesting places to visit including The Pottery in Crail, The East Pier Smoke House in St Monans, The Coco Tree in Pittenweem and many galleries (the area is renowned for being home to 32 working artists), and lots more. St Andrews is only 20 minutes away with its world famous golf courses, history and cultural heritage. There are approximately 150 eateries in St Andrews so lots of choice for everyone! If you like visiting historic houses both Kellie Castle, with its magnificent gardens, and Cambo House are close by. Garden kitchen room - ideal for alfresco dining! Wynd House is a very special house with loads of history. It is truly vintage and full of character, with lots of interesting pictures, letters and books. 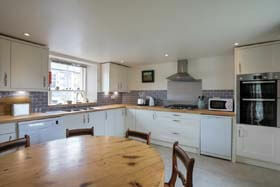 It has a fantastic location right on The Terrace in Elie, a very sought after holiday spot. The house has four reception rooms, is very comfortable throughout and the decor is retro but chic. It has a fully fitted and equipped kitchen, with all the utensils, gadgets, and houseware for the most discerning of cooks. Next door is the dining room, with seting for 14 for more elegant dining - so if you are a large group then you can all eat together. The bedrooms are on the upper floor. The master bedroom is a large double room with a bay window looking over the beach and harbour, and view to the walled garden. 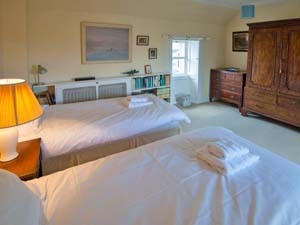 Bedroom two is a spacious twin / double room with turret room and also has views over the beach and harbour. The third bedrooms is a single room overlooking beach/harbour. 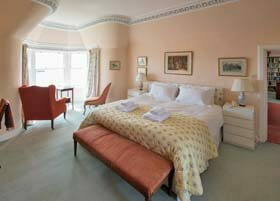 Bedrooms four and five are two adjoining twin / double rooms overlooking the garden and street. 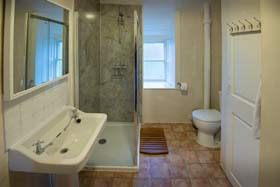 There are two large bathrooms, both with large baths, one with a shower. The large landing has a feature cupola/conservatory which allows the light to flood in. On the garden level, is a boot room which stores all sorts of sports and outdoor equipment from wellies and fishing rods, to wet suits and golf clubs. There is also a cloakroom on the ground floor. Outside there are four walled gardens with one that has access to the sea - you'll find you have loads of privacy and space. There is a 'garden kitchen room' and BBQ area in the large walled garden which makes catering in the garden a whole lot easier. The room has sinks, a fridge plus plates, cutlery and glasses. A gentle stroll takes you to all the local amenities in the village. If you are a large group then the accommodation is perfect as there is a separate (but adjacent) cottage which can be rented along with Wynd House - ideal if some want to escape the hustle of a big party to the peace and quiet of their own space! Sea Spice has been created within the old stable block which sits centrally in the Wynd House gardens. It has one bedroom which can be twin or king sized, a shower room and a lovely large vaulted kitchen /dining / sitting room. There is a comfortable sofa bed in the living room so the cottage can easily sleep 4. 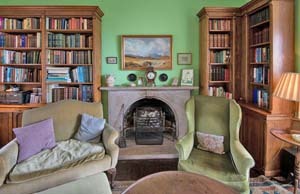 The second reception room has an open fire and a plethora of books which guests can read. The cottage has heaps of character, is very warm and cosy. If the cottage is rented with Wynd House then it gives accommodation for 14 people. From Edinburgh head to Leven and follow the coastal road to Elie - a direction sheet will be issued when you book. Central heating and logs for the woodburning stove are included in the rental price along with some consumables. Hotel-quality bed linen is provided. Wynd House is rented out throughout the year. Change over day is Friday in season, but there is flexibility. 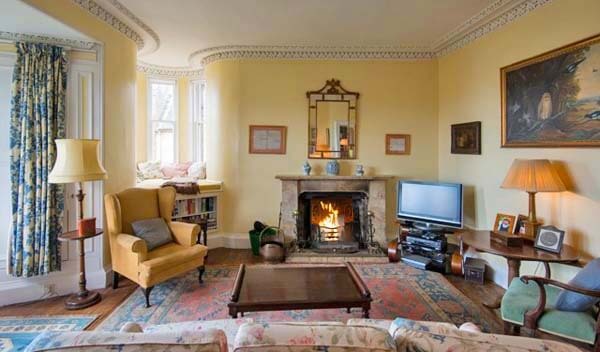 To enquire about booking this fabulous, historic house in the centre of Elie, click the enquiry button below to see cost and availability. Wynd House offers superb self-catering in Elie and is a great place to stay if you want to explore the East Neuk of Fife. It's ideal if you are a large group as the house sleeps 14. Elie has a legendary sandy beach and with a golf course and water sports and it's understandably a very popular holiday destination for families.